Casey Stevenson practices primarily in the areas of commercial litigation and bankruptcy and creditors’ rights. He also advises clients regarding the Patient Protection and Affordable Care Act. In the area of creditors’ rights and collections, Casey represents credit unions, banks, and other financial institutions on issues related to their consumer and commercial collections accounts, including collecting deficiency balances, sequestrations, and foreclosures of real and personal property. In addition, Casey helps property management companies and real estate developers collect delinquent accounts, resolve construction issues, and assists with evictions. Casey has also been active in filing mechanic’s and materialmen’s liens on behalf of the contractors and prosecuting claims to collect amounts due on construction contracts. Similarly, Casey assists international business entities with their domestic collections efforts. With respect to the Affordable Care Act (ACA), Casey focuses on employer compliance and regulatory issues, including proactive business and insurance solutions, contractual issues, and implementation of employer procedural safeguards related to the ever-changing ACA landscape. In the area of transportation and logistics, Casey represents transportation entities such as brokers, carriers, and consignors with breach of contact and collections claims. For example, Casey routinely represents freight brokers on Carmack Amendment, bill of lading, and contract of carriage claims. Casey is licensed in Texas and New Mexico and represents clients in both state and federal court. 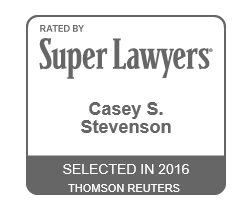 Casey was named as a “Texas Rising Star” in 2009, 2010, 2011, 2012, 2013, 2014, and 2015 by the Texas Super Lawyers and publishers of Texas Monthly and Law & Politics magazine. He is a member of the American Bar Association, El Paso Bar Association, El Paso Young Lawyers’ Association, Texas Association of Defense Counsel, Transportation Lawyers’ Association, and American Health Lawyers Association. Regarding community engagement, Casey is actively involved with the ACTS ministries at St. Patrick’s Cathedral, El Paso Diocese, and currently sits on the executive board of the El Paso Central Business Association and sits on the Parish Council of Sagrado Corazon Catholic Church in the Segundo Barrio of El Paso. In addition, Casey is a former member of the boards of directors for the El Paso Children’s Miracle Network, El Paso County Historical Society, and Creative Kids, Inc., a non-profit organization dedicated to promoting art education and awareness. Brockhaus v. Luis Miguel, 1:15-cv-02707(KBF)(FM), United States District Court for the Southern District of New York (pending). El Paso Educ. Initiative, Inc. v. Amex Props., LLC, 385 S.W.3d 701 (Tex. App.—El Paso 2012, pet. denied). 2018, May. Evidentiary Issues in Collection Cases. Presenter, Texas Collections and Creditors’ Rights Course, Houston, Texas. 2018, March 1. Unriddle the Riddler: the Latest Developments on the Affordable Care Act.. Lecture presented at the ScottHulse Labor & Employment Law Seminar. 2017, September. Lecture presented at the EPSHRM Employment Law Update, El Paso Texas. 2015, 2016 & 2017. Texas Debt Collection Manual. Editor and Author, State Bar of Texas. 2017. Fair Debt Collection Practices Act. Author and Presenter, Texas Collections and Creditors’ Rights Course. 2016. Post-Judgement Discovery and Enforcement. Author and Presenter, Texas Collections and Creditors’ Rights Course. 2015. Overcoming Evidentiary Defenses. Author and Presenter, Collections and Creditors’ Rights Course. 2014. Expedited Rules and Early Dismissal. Lecture presented at the Collections and Creditors’ Rights Course in Texas. 2012, March 30. Wage and Hour Update: Recent Developments. Lecture presented at the ScottHulse Labor & Employment Law Seminar in El Paso, Texas. 2011, March 4. Union Avoidance: A Canvas of Conflict. Lecture presented at the ScottHulse Labor & Employment Law Seminar in El Paso, Texas. 2010. Proactive Investigation Techniques. Lecture presented at the ScottHulse Labor & Employment Seminar in El Paso, Texas. 2010. History of Unions in the United States. Lecture presented at the ScottHulse Union Training Seminar in El Paso, Texas.